waiting to see if you end up untethered and fallen, jumping helplessly and aimlessly, smothering tight in your own anxiety, unable to grab at resources, but all the while waiting for someone to pull you back up, if you do fall, so you can get back to the business of “becoming” something, safe in your cocoon? Maybe you’ve lost hope you can get to the butterfly stage. Maybe others along the way told you you’d never make it. Maybe you are certain that you won’t even get your wings out. What’s the point? It’s too hard. After all, you’ll probably be one of the many caterpillar statistics out there with a fallen chrysalis. Maybe you don’t believe enough to climb the twig or branch and attempt the next step. Some days a thin thread is all that seems to hold us there. A jolt from this crisis or that stressor threatens to knock us down if we’ve even been bold and hopeful enough to make the climb. Even the winds of change can blow us back and forth on that delicate string—the only thing that seems to keep us from smacking down in failure. I have no idea if Smiley will emerge a healthy butterfly. He may surprise me and end up a moth. All I know is that I’m going to keep trying to get him up there, avoiding disturbing or handling him as much as I can. I want him to have the best chance. He got this far, after all. “Hear this, O Job; stop and consider the wondrous works of God. Do you know how God lays his command upon them and causes the lightning of his cloud to shine? In these verses, Elihu reminds Job that only God holds the clouds in balance and causes the lightning to shine. 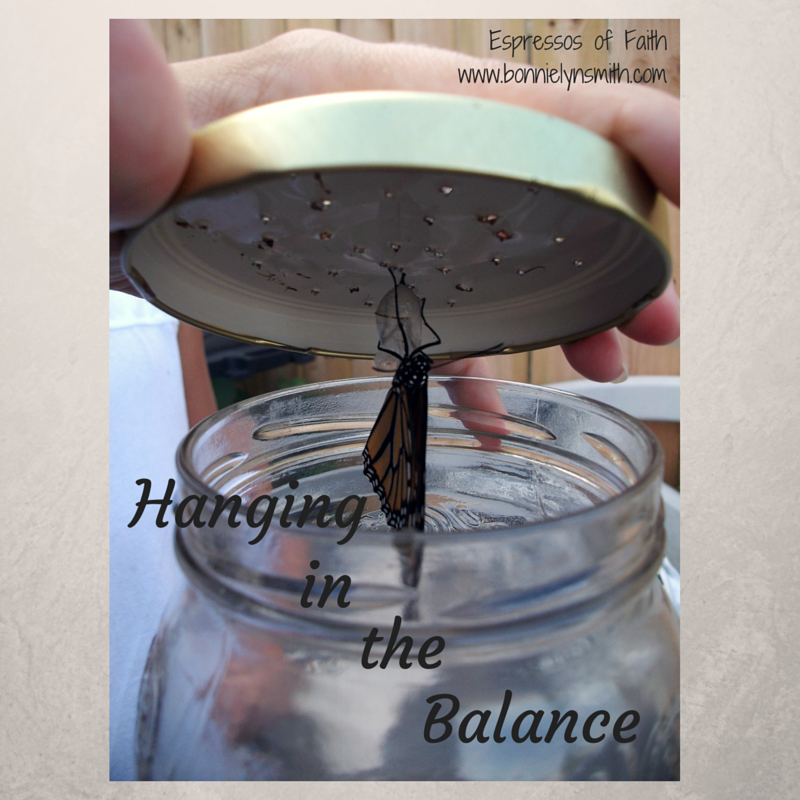 When you really think about it, we often put our faith in some mythical Steps A, B, and C of hanging our chrysalis up in safety, when, really, thread or no thread, if God wants us to become butterflies, we will. It doesn’t matter how many obstacles appear to be in our way. It doesn’t even matter if what we thought was our safe cocoon ends up in a heap on the floor. When we break free of the false safety we often hide within, it’s often in that place that our wings take full flight. [Samekh] I hate the double-minded, but I love your law. Hold me up, that I may be safe and have regard for your statutes continually! How does the psalmist refer to his hiding place? As God himself (“You are my hiding place and my shield”) and also His Word. What connection does he make to remaining attached to the safety God provides? Staying out of the counsel of (or away from) evildoers, and obeying God. He knows Who it is that keeps him in hope, promise, and safety. I don’t know about you, but when I’m despairing or tempted to think in negative terms, listening to and believing the naysayers, evildoers, or double-minded around me, a thin string of my own contriving isn’t enough. I need the promise of a Savior, a Creator, Who brought me into this life with purpose and will hold me up, just like the clouds. Instead of fearing life outside the cocoon of my own making, I can roll up inside His promises and know He will carry me to the next step. Fallen as I am at times, He will see me to completion, just like the butterfly. 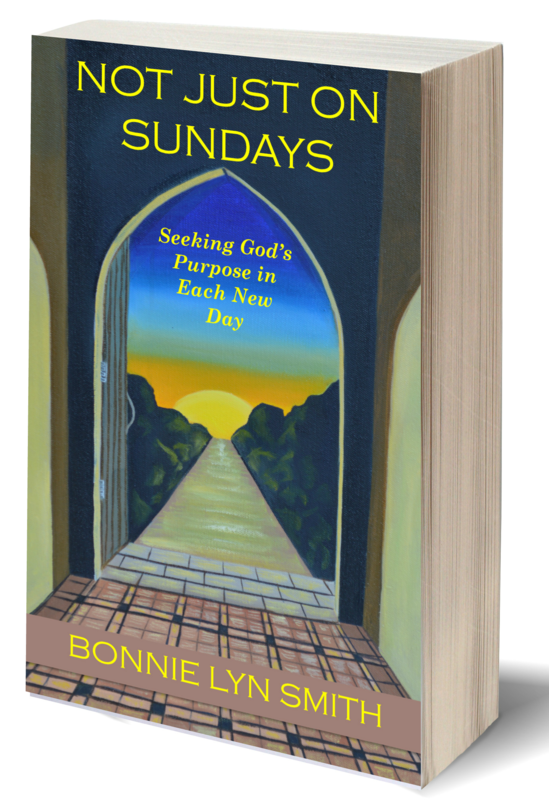 He already sees you, through the finished work of the cross, as unblemished and complete, soaring with His Spirit (a gift to you) beyond what you thought was ever possible—beyond your former sway of uncertainty inside a chrysalis of self-protection and assumed defeat. Oh, the lessons to be learned through nature! I am hoping that Smiley will find a way to break free into glorious and fully functional wingdom! Loved the lessons that you brought out today. I tend to be a cocoon sort of girl, so I appreciated your most encouraging words. And, according to God’s Word, HE can enable us to soar on wings like eagles – so that’s what I’m praying for and holding on to right now!